Eddie Redmayne attended the 85th Annual Academy Awards in Hollywood yesterday evening. The 'Les Miserables' actor wore an Alexander McQueen black single breasted one button shoulder tuxedo with peak silk faille rever, gold barbed wire cufflinks and black velvet skull slippers. Eddie kind of let the cat out of the bag when he was pictured at Los Angeles airport a few days earlier with a McQueen garment carrier. Nonetheless, it was a good look for him, you can't really deviate too far from the standard black tie dress code at the Oscars. His choice of the black velvet skull slippers was a nice touch. And it's nice to see this British rising star wearing a British label on this momentous occasion. 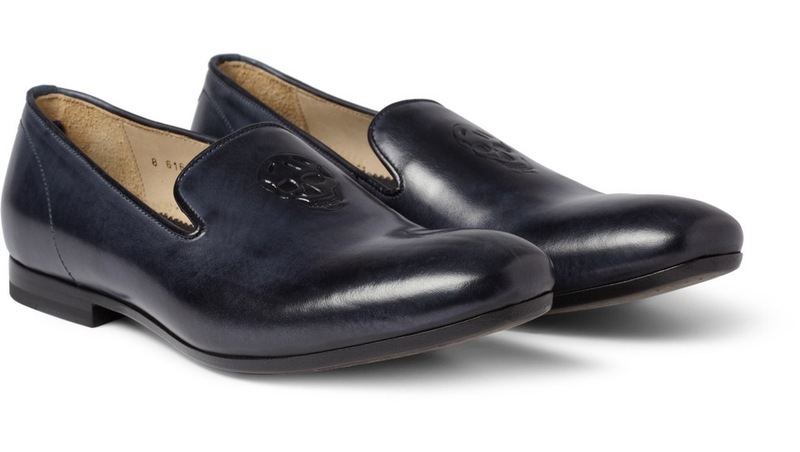 Get Eddie's look with these skull slippers in smooth calf leather. You can get it online from Mr Porter International and Mr Porter (US).